L-R : Prof. Tarun Khanna, Director- the Lakshmi Mittal and Family South Asia Institute and Jorge Paulo Lemann Professor, Harvard Business School, Mr. Amitabh Kant, CEO, NITI Aayog; Dr. V.K. Saraswat, Member (S & T), NITI Aayog and Chancellor, Jawaharlal Nehru University; Ms. Kiran Mazumdar Shaw, CMD, Biocon; Dr. K. Vijay Raghavan, Principal Scientific Adviser to the Government of India. New Delhi: Focusing on the role of academia and government in catalysing intersection between industry, scientific development and societal need, the Lakshmi Mittal and Family South Asia Institute (LMSAI) at Harvard University in partnership with the Office of the Principal Scientific Advisor to the Government of India and NITI Aayog, concluded an eventful, Annual India Symposium – ‘Science and Society’ at Vigyan Bhawan in New Delhi on 4th April. Science and Society are two elements that share a symbiotic relationship, neither of the two can truly flourish without the intervention of the other. The event went ahead on the same lines to elaborate on the role of science in developing society. 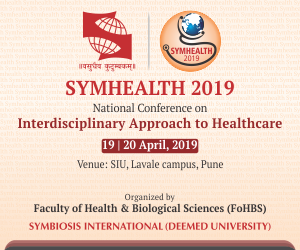 The symposium, which hosted scientists from leading universities in the US and India, identified three overarching strategic objectives, all directed to bolstering the intellectual ties that bind scientists to one another, and science to society. More than 150 leaders from business, academia, industry, government and the research community, as well as officials and students from 20 academic institutes in India, took part in an event that also marks Harvard University’s increased academic research presence in India. The Symposium was graced by eminent leaders like Mr Amitabh Kant, CEO, NITI Aayog, Dr K Vijay Raghavan, Principal Scientific Adviser to the Government of India, Prof Tarun Khanna, Director- the Lakshmi Mittal and Family South Asia Institute and Jorge Paulo Lemann Professor, Harvard Business School, amongst other. Speaking at the event, Prof Tarun Khanna, Director- the Lakshmi Mittal and Family South Asia Institute and Jorge Paulo Lemann Professor, Harvard Business School said, “The Mittal Institute has been active in India for over a decade, serving as a platform to facilitate a two-way exchange of ideas between Harvard and Indian universities, government agencies and civil society. LMSAI is an original source of thinking that advances our understanding of the key issues of our day – from STEM to technology in agriculture to the age of biology. As a multi-disciplinary Institute within Harvard, we have the advantage of working with faculty across all departments and professional schools at the University. We regularly bring creative minds together to provide multiple perspectives on ideas that can address complex societal problems facing South Asia and further help in policy decision making”. Spread across six sessions, the Symposium hosted industry veterans who deliberated on a number of issues. While one session talked about technological advancements in agriculture, focusing on enhancing productivity and ensuring food security for our country, another session focussed on ‘Catalysing India’s Digital Health Ecosystem’, wherein Mr J Satyanarayana, Chairman, Unique Identification Authority of India elaborated on the significance of Big Data and Artificial Intelligence. In a discussion on Methods and Tools to Enhance STEM Education in India, Mr. R. Ramannan, Mission Director, Atal Innovation Mission, touched on issues revolving around talent mismatch- the evident disparity between college curricula and industry expectations being one of them. He further spoke about many tools that can be used to propagate idea of pursuing STEM careers among students. 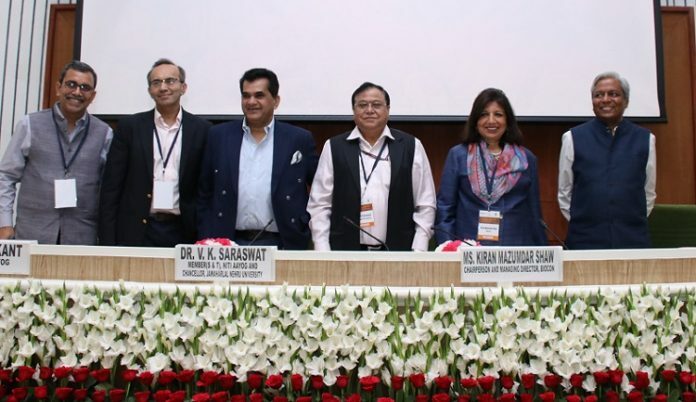 Other distinguished names gracing the summit included Dr Rajiv Kumar, Vice Chairman, NITI Aayog; Ms Kiran Mazumdar Shaw, CMD, Biocon; Dr V K Saraswat, Member (S & T), NITI Aayog and Chancellor, Jawaharlal Nehru University; Manoj Kumar, Senior Advisor & Head – Innovation, Tata Trusts; Satchit Balsari, MD, MPH, Assistant Professor, Harvard Medical School; Sunita Nadhamuni, Head, Healthcare Solutions, Dell Technologies; Venkatesh Murthy, Professor and Chair of Molecular and Cellular Biology, Harvard University, Mr Dmitry Popov and Mr Ankur Goel, John A. Paulson School of Engineering and Applied Sciences, Harvard University, among many others. Dr Rajiv Kumar, Vice Chairman, NITI Aayog concluded the event, enlightening on the way forward by building a culture of science literacy in India. This society-centric Symposium, included some grave issues that our country is facing right now- in terms of agriculture, education and health. It also acted as a platform to make people from diverse disciplines come together to discuss these issues and spread awareness about substantial and productive change in the society.